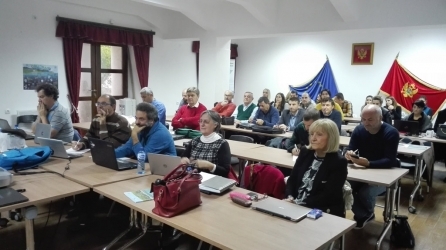 Within the GEF Adriatic Project “Implementation of the Ecosystem Approach in the Adriatic Sea through Marine Spatial Planning”, a national training workshop for Albanian and Montenegrin experts was held on 26-27 November 2018 at Kotor Institute of Marine Biology, Montenegro. The workshop focused on monitoring techniques and data gap assessment process for the three following Ecological Objectives (EO) of the Integrated Monitoring and Assessment Programme of the Mediterranean Sea and Coast (IMAP): EO1 Biodiversity, EO2 Non-Indigenous Species and EO7 Hydrography. The training was organized by SPA/RAC and PAP/RAC in close collaboration with the National GEF Adriatic Project coordinators, Ms Ivana Stojanovic and Mr Zamir Dedej, and the Kotor Institute of Marine Biology. The training sessions were provided by Dr Nada Krstulović (IMAP), Dr Yakup Kaska (Marine turtles, as an indicator of the EO1), Dr Marco Zenatello (Sea Birds/EO1), Dr Argyro Zenetos (Non-Indigenous Species), Dr Ivan Guala (Marine habitat/EO1) and Dr Olivier Brivois (Hydrography). As a second step, the national experts will prepare the national data gap assessment on EO1, EO2 and EO7 with the trainers’ assistance and SPA/RAC and PAP/RAC support.